If you are looking for information on the DreamMaker Bath & Kitchen franchise business opportunity, DreamMaker franchises or Dream Maker Bath & Kitchen franchising, then you have come to the right place. 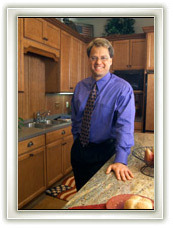 DreamMaker Bath & Kitchen by Worldwide® is an exclusive bath and kitchen remodeling franchise organization. We have franchisees in more than 90 locations around the world and more than 30 years experience in taking businesses to the next level of success. DreamMaker Bath & Kitchen is the premier kitchen and bath remodeling business, offering exciting opportunities in the residential and commercial markets. The whole is greater than the sum of its parts. The combined strength of the DreamMaker team accelerates and enhances each member's level of success. As a DreamMaker Bath & Kitchen franchisee, you also become part of a nationwide network of many other DreamMaker Bath & Kitchen franchisees. Through team conferences, the Annual Convention (Reunion), Internet communication, as well as the use of conference training calls and peer networking groups, you will have the opportunity to meet and develop associations with successful DreamMaker Bath & Kitchen business owners. You learn from each other, share ideas and experiences, and provide each other with support, advice, and professional camaraderie. It's the spirit of cooperation, not competition. In addition, you become part of a worldwide network of businesses and have a powerful association not only with The Dwyer Group®, the world's premier service business franchisor. DreamMaker Bath & Kitchen's association with other franchises, including Rainbow International Restoration and Cleaning®, Mr. Rooter®, AireServ®, Mr. Electric®, Mr. Appliance® and Glass Doctor® gives you the benefits of networking, national buying power, and much more.